At Mobile World Congress next week, Nokia Siemens Networks(s nok)(s si) plans to reveal its most ambitious mobile network design to date: a complex system of 100 small LTE, HSPA and Wi-Fi cells that behaves, from the network’s point of view, as a single cell site. NSN is using a concept from cloud computing called a ‘fabric’ and retooling it for the purposes of mobile broadband. While we probably won’t see this technology in live networks for some time, it has huge implications for the heterogeneous networks (or hetnets) of the future, which aim to create a sea of cheap bandwidth through which our devices can leisurely swim. Such architectures speak to the growing complexity in cellular networks as more people use more devices on them. Plus, the very mobility of such devices makes building out a network even more of a challenge. Base stations are fixed devices with fixed characteristics. Turning them into something that can scale to deliver capacity on command isn’t easy. But NSN thinks it has found a way. Called Flexi Zone, the network looks a bit like the distributed antenna systems (DAS) operators have deployed at sporting venues and in office buildings to spread the normally circular cell into indoor nooks and crannies. But Flexi Zone goes far beyond the mere redistribution of coverage. Instead it allows an operator to densely pack 100 cells’ worth of capacity into a confined area, while shaping the network’s coverage to the exact contours of the shopping mall or stadium it inhabits. Small Cells. Imagine femtocells and Wi-Fi access points having a big party where everyone is hopped up on speed, and you get the idea. Hetnet aims to create a multi-layered network, in which traditional macro-cellular towers provide a blanket of coverage, while underneath that umbrella hundreds of thousands of small cells in high-traffic areas do the heavy bandwidth lifting. 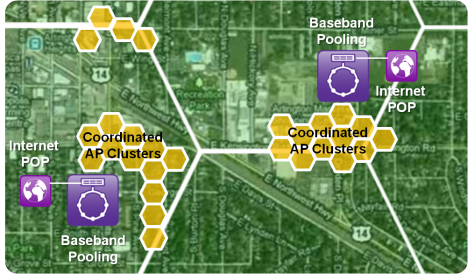 NSN’s Flexi Zone, however, uses small cells for both coverage and capacity. Macro cells often can’t reach the indoor environments Flexi Zone is designed for, so the small cells pull double duty. Cloud RAN. Perhaps the most far-out concept in Flexi Zone’s architecture, NSN’s Liquid Radio concept would decouple the base station from the radio. We have written before about Intel(s intc) and other vendors’ attempt to move the radio access network (RAN) into the cloud, where the processing resources and intelligence of the network can be pooled and then applied wherever they’re needed at any given moment. Flexi Zone would leave a limited amount of baseband capacity at each small cell to support normal capacity conditions. But when things get hairy, the cloud kicks in, taking over much of the computational load of a congested cell. This allows operators to scale their networks more efficiently by not having to overbuild each cell for peak traffic conditions. Mesh Networking. One of the biggest limitations of small cells is backhaul. A high-capacity LTE radio can’t be backhauled with string and twine, but connecting hundreds of thousands with fiber links is a daunting if not impossible task. So NSN is taking a page from the metro Wi-Fi’s book, using radios to backhaul other radios. High-capacity 802.11n links and even LTE will connect the closely spaced nodes together. To deploy a small cell, the operator just needs to find a wall power outlet. Self-Organizing Networks. When you have a hundred densely packed cells all running on the same frequencies, you have the potential for an interference mess, and operators can’t do the careful testing and tuning they perform on the macro network at the scale small cells require. NSN is using self-organizing network, or SON, technology to give each cell enough self-awareness to identify its neighbors and keep its own transmission power in check, thus avoiding chaos over the airwaves. This kind of network self-management is pretty nifty, but things get really exciting when the equation includes dynamic SON, which allows individual cells to grow and shrink as traffic patterns change. Sounds neat, but why does this matter? NSN said the benefits of the technology would be multi-fold. Flexi Zone not only provides a solution for indoor coverage – where most mobile data traffic is moving these days; it can also supply orders-of-magnitude more capacity than a macro cell over the same square footage. And because of the Cloud-RAN and mesh techniques, infrastructure costs drop. NSN concluded that operators can use Flexi Zone to cut in half the cost of delivering a bit of traffic. Whether operators would pass those savings on to their customers in the form of cheaper data plans is another question, but more efficient network technologies are definitely key to propelling the mobile data revolution forward and offsetting the need for operators to secure more spectrum in the future. Because Flexi Zone makes extensive use of Wi-Fi, operators can also tap into free unlicensed spectrum and cheap Wi-Fi networking gear, adding gobs of capacity to their networks for little cash. NSN’s Flexi Zone is definitely the most ambitious hetnet proposal we’ve seen coming out of Mobile World Congress so far, but it’s not the only one. Alcatel-Lucent’s lightRadio architecture already uses many of the same Cloud-RAN and small cell techniques as Flexi Zone and Liquid Radio, and at MWC the Franco-American vendor is adding Wi-Fi to the mix. At the event, InterDigital(s idcc) plans to show how Wi-Fi can be wedged into the white-spaces spectrum between TV broadcasts to add more oomph to mobile network connections. Ericsson(s eric) is buying its way into Wi-Fi. We broke the story of its purchase of metro Wi-Fi vendor BelAir last month, and on Tuesday Ericsson confirmed the deal. Next week in Barcelona we’ll probably hear the first details on how Ericsson will incorporate BelAir’s hybrid Wi-Fi/cellular technology into its portfolio. BelAir competitor Ruckus Wireless plans to unveil its first hybrid Wi-Fi/LTE small cell at show, using the same mesh-networking techniques as Flexi Zone to create dense capacity clusters for outdoor environments. As I wrote last week, for a show focused on cellular networking, MWC is taking on a strong Wi-Fi tone this year. Not all operators have gotten Wi-Fi religion yet, but their vendors certainly have. By weaving Wi-Fi more intimately into the network fabric, NSN may gain some converts. They’re using WiFi to backhaul LTE? It makes sense to move the network elements around…but I guess we’ll have to wait until next week to completely connect the dots. Does anybody recall “Nokia Rooftop” that they released around ten years ago? It was killed of internally, but was unique and novel. Perhaps Liquid Radio has some of that IP and those folks on this project. And there’s no guarantee the operators will actually go for it either. They’ve only just started talking about small cells and hetnet.